Fri., 2 Aug. - Wed., 14 Aug.
See all 129 properties in Birmingham Intl. 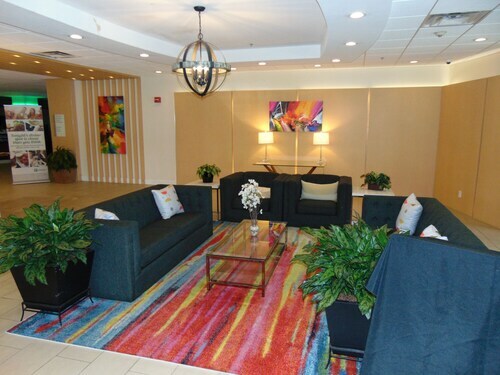 Situated in Birmingham, this hotel is within 6 mi (10 km) of St. Vincent's Health System, University of Alabama Hospital, and Children's of Alabama. Situated near the airport, this hotel is within 3 mi (5 km) of Avondale Brewing Company, Southern Museum of Flight, and Alabama Symphony Orchestra. Sloss Furnaces and Alabama Ballet are also within 3 mi (5 km). Situated in Birmingham, this motel is within 3 mi (5 km) of Southern Museum of Flight, Avondale Brewing Company, and Train Watching Platform. Alabama Symphony Orchestra and Ruffner Mountain Nature Preserve are also within 3 mi (5 km). Situated in Birmingham, this vacation home is within 6 mi (10 km) of Southern Museum of Flight, Birmingham Jefferson Convention Complex, and Ruffner Mountain Nature Preserve. Avondale Brewing Company and Sloss Furnaces are also within 6 mi (10 km). Situated in Birmingham, this historic vacation home is 1.2 mi (1.9 km) from Avondale Brewing Company and within 3 mi (5 km) of Alabama Symphony Orchestra and Highland Park Golf Course. St. Vincent's Health System and Sloss Furnaces are also within 3 mi (5 km). Situated near the airport, this hotel is 0.5 mi (0.8 km) from Train Watching Platform and 2.4 mi (3.9 km) from Ruffner Mountain Nature Preserve. Birmingham Race Course and Southern Museum of Flight are also within 6 mi (10 km). 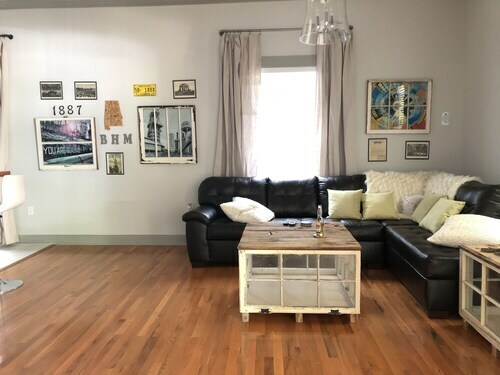 Located in Avondale, this vacation home is 0.5 mi (0.8 km) from Avondale Brewing Company and within 3 mi (5 km) of University of Alabama-Birmingham and Alabama Theater. University of Alabama Hospital and Birmingham Museum of Art are also within 3 mi (5 km). 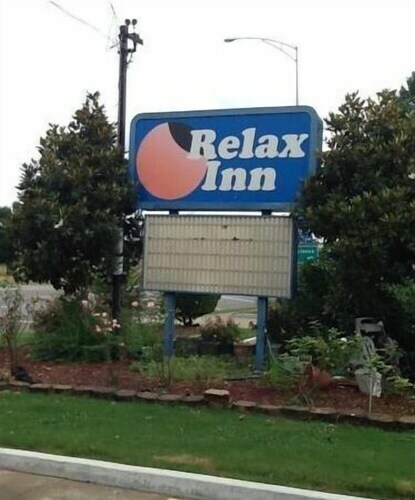 Located in the heart of Birmingham, this hotel is 1 mi (1.6 km) from Train Watching Platform and 2.5 mi (4.1 km) from Ruffner Mountain Nature Preserve. Birmingham Zoo and Southern Museum of Flight are also within 6 mi (10 km). Answer : Yes, you can change your departure or arrival date. If you would like to save some funds in doing so, the cheapest day to fly in April is Thursday. If you like to go with the flow, you may just find that you can pocket some extra money. Question : How much time do people spend in Birmingham? Answer : The average time spent in Birmingham by passengers from Detroit is four days. However long you decide to stay, give yourself plenty of time to see what makes Birmingham fantastic. Question : How long does it take to fly from Detroit to Birmingham? Answer : Flying from DTW to BHM usually takes about two hours and 11 minutes. Remember, there is a one hour time difference. Question : How many flights are there per day from Detroit to Birmingham? Answer : Of course, the day matters, but on average, seven different flight times exist when you fly from DTW to BHM. That is lower than the national average of nine. Question : How much is a plane ticket to Birmingham (BHM) from Detroit (DTW)? Answer : Prices can range from $163 to $1,070. Booking far in advance can typically help you get the cheapest ticket. The further out you book your ticket, the more likely you are to save on your trip. Question : What is the cheapest date to fly to Birmingham? Answer : Tickets are currently being sold for $262, which is 42% less than the average price for this route. As of Apr 15th, the cheapest day to fly from Detroit to Birmingham is Apr 16th. Question : Which airline has the least delays from Detroit to Birmingham? Answer : Booking with Delta Air Lines means you will arrive to Birmingham around the time you were supposed to. In fact, this airline has a 100% average for getting there on time.